These are a set of gears usually two or more on or inside a larger gear. They make drastic gear ratio possible. They are used when one wishes to turn the input in the same direction as the output. The gear in the center of the larger gear, called the sun engages two or three smaller gears placed in the same large gear. These small gears are called planet and they are engaged to the inside of the large gear called the ring. Planet gears turn on movable center and the sun gears turn on a fixed center. In a planetary gearing, the member which receives motion from outside the mechanism is called the driver; the member from which motion is taken outside the mechanism is called the follower; the member which carries one or more bearing pins about which the planet gears rotate is called the train arm. There is only one member that is maintained in a fixed position. Planetary gears are also used to produce different gear ratios depending on the which gear is used as input, which one as output and which one is held stationary. An automatic transmission uses planetary gearsets to create different gear ratios using clutches and brake band to hold different parts of the gearset stationary and change the input and the output. 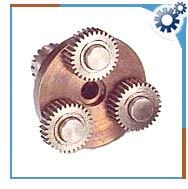 Planetary gears are most commonly used gear train. Planetary gear trains have several advantages. They have higher gear ratios. They are popular for automatic transmissions in automobiles. They are also used in bicycles for controlling power of pedaling automatically or manually. They are also used for power train between internal combustion engine and an electric motor.